The Title Report newsletter continues to be the title insurance industry's premier source of news and information, is published every 10 calendar days and provides 24-7 news on its companion website. Subscribers are success-oriented decision makers that have demonstrated by paid subscription to our products that they have the authority and willingness to invest their time and money, as well as a desire to understand the changes and challenges to the industry. 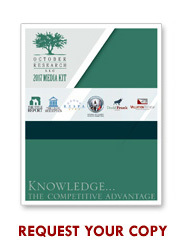 Your flyer or brochure is placed within the print and electronic versions of The Title Report newsletter. Your banner or button is placed within a daily news update. Sent three times a week to the e-mail list for The Title Report market, this is just-heard news that is not included within the newsletter. Your exclusive ad is sent to the e-mail list for The Title Report market. Your banner, button or billboard ad is placed on Home and/or Story pages and viewed by an average of over 7,500 visitors who access the website over 15,000 times each month. Contact us today via e-mail or call 330-659-6101 x 317 and let us recommend an advertising program that achieves your marketing objectives.